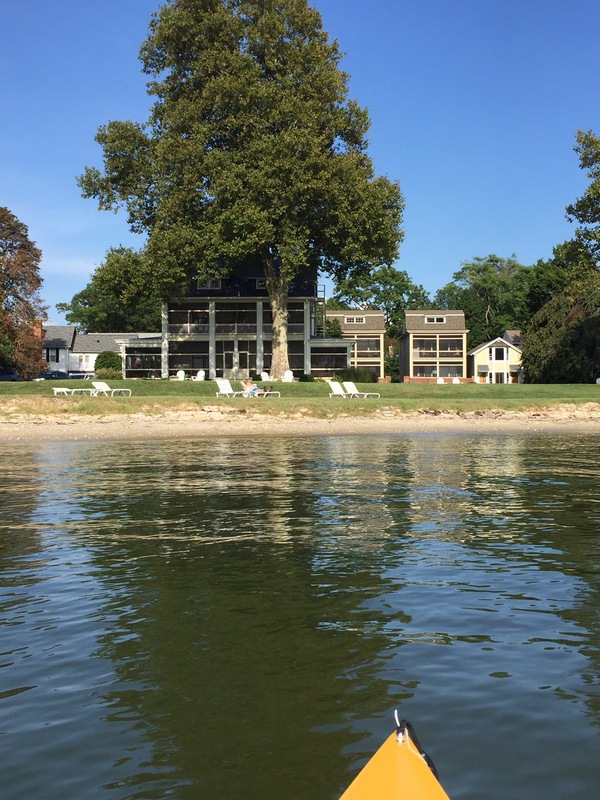 I’m back from a fabulous weekend in Oxford, Maryland, with my husband. 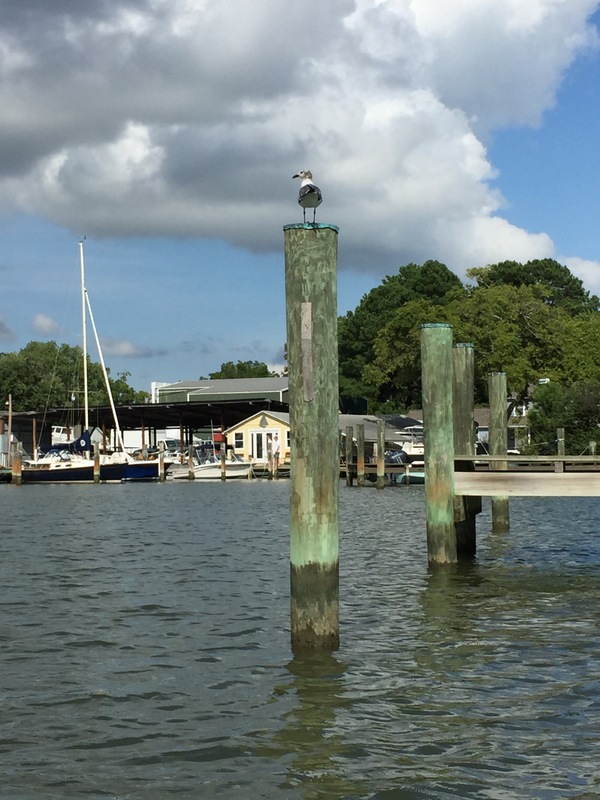 The Eastern Shore of Maryland is uniquely qualified to sufficiently relax you, while at the same time, invigorate your creative spirit. 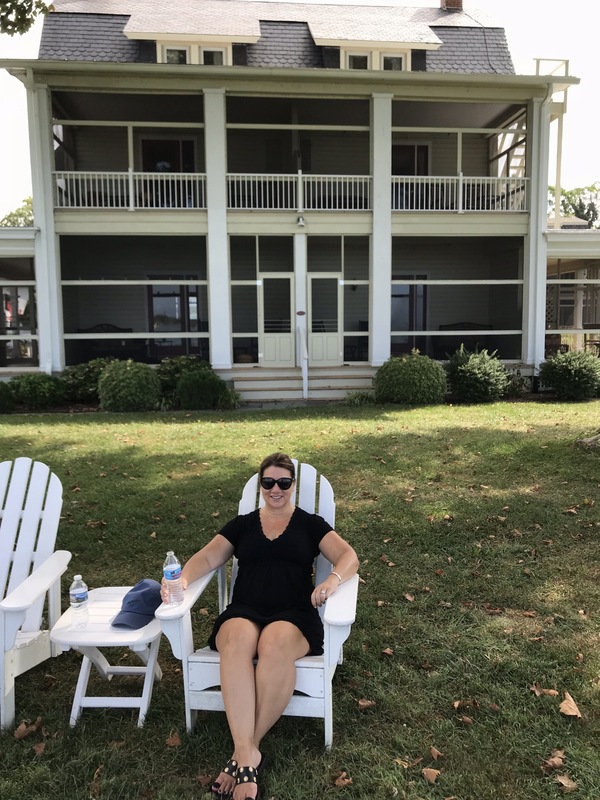 And if you’ve been following along on my blog for the last week, I needed the getaway so much, having pulled my lower back in the most extraordinary of ways (bending over to reach for something in a drawer, go figure!) that left me in pain for a good 10 days. Having nursed myself back from that injury to being able to enjoy the weekend without agony was an accomplishment in itself. Hours spent on my heating pad, innumerable icy hot patches, and some anti-inflammatory drugs from my doctor did the trick. I was so thankful. 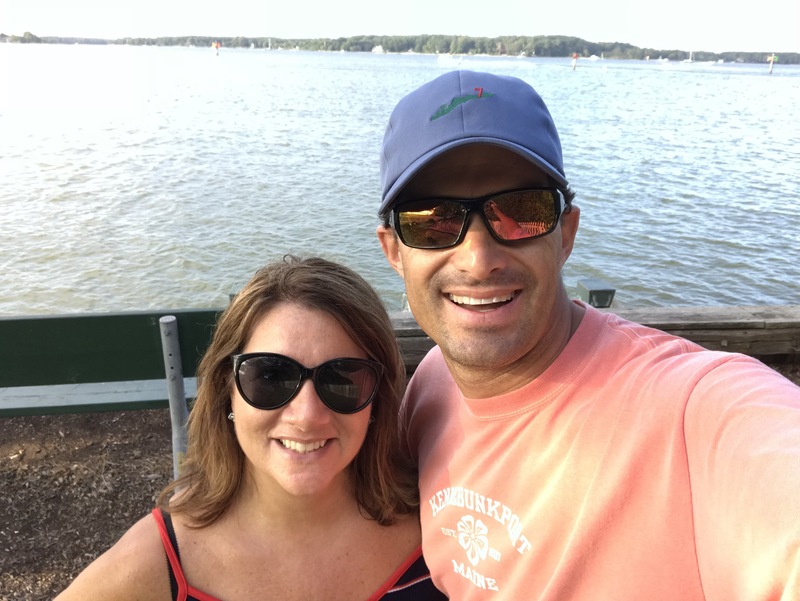 I was able to bike around the town and kayak on the Tred Avon River with my husband, and I felt great. 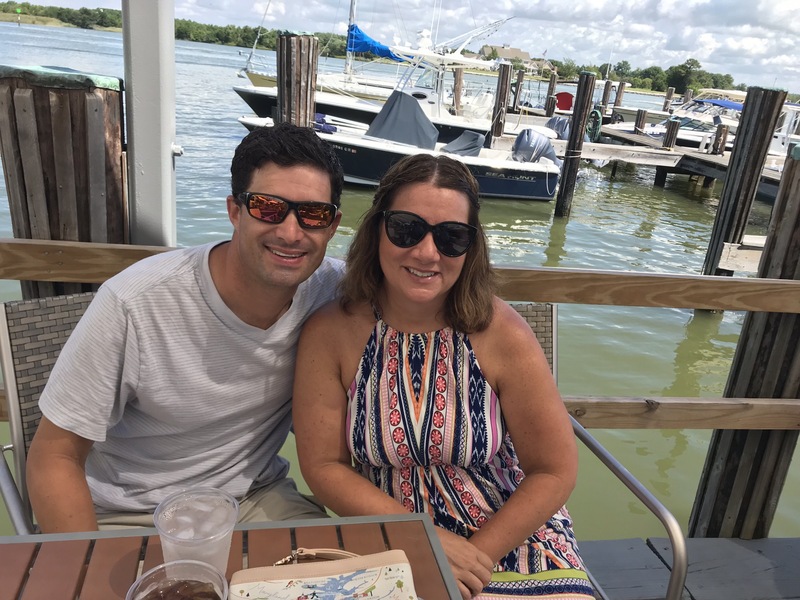 If you’ve never visited my blog before, you need to know that I had to go back to Oxford, and requested this little trip as a birthday present from my husband, because I’m not sure if I’m done with Milly and John yet; I’m still toying with them. Milly and John are the two main characters in my third novel, Inn Significant, and something tells me those characters might need a sequel (as do a few of my readers who are requesting more of them). 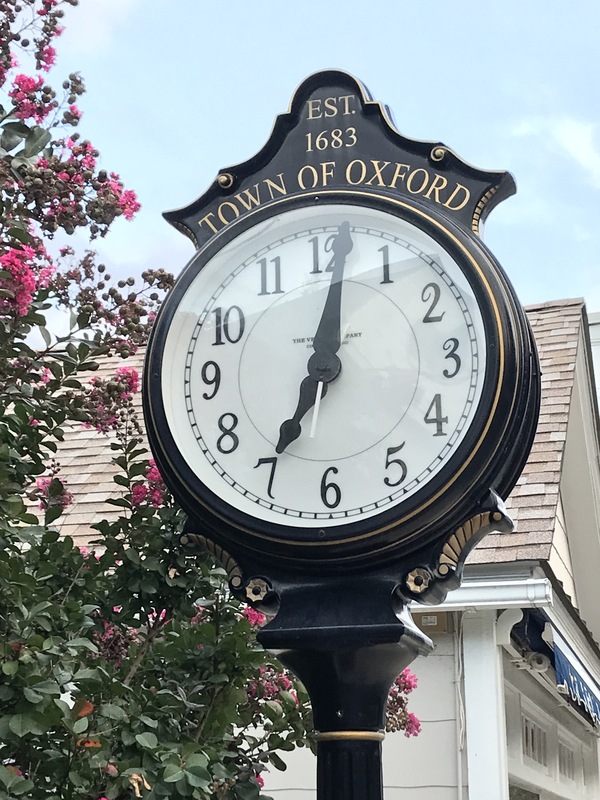 We decided to do immersive research, and the results of that research in Oxford has led me to this conclusion—I was right to set my novel in this picturesque, small, and charming town. 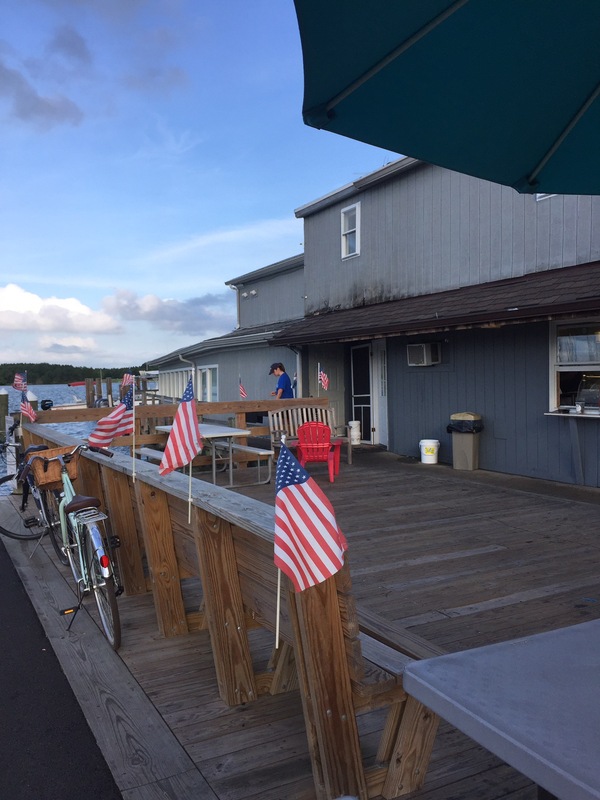 The people are warm and welcoming—overly friendly—and there is a tight-knit spirit among the locals, as well as a sense of pride about their town. Visitors we talked to along the way, and there were many, were enamored with Oxford as well. One family we met rented a home down the street from the waterfront beach area in Oxford, and were enjoying the simple pleasures of swimming in the river with their new puppy, a Golden Retriever named Molly, who swam for the first time. “I’m trying to figure out how to afford a second home here,” a woman named Rochelle told me as we talked on the beach. 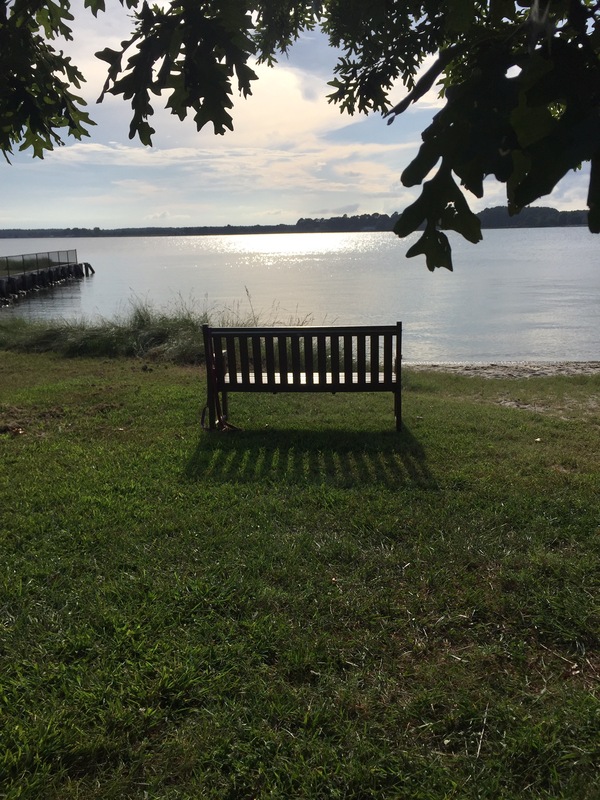 We saw people take their beach chairs to the water’s edge to read and get some sun as the waves gently rolled onto the small sandy beach. We passed anchored boats in the harbor on the kayak we rented for two hours where people were enjoying a drink and reading on board while feeling the breeze and getting some sun. 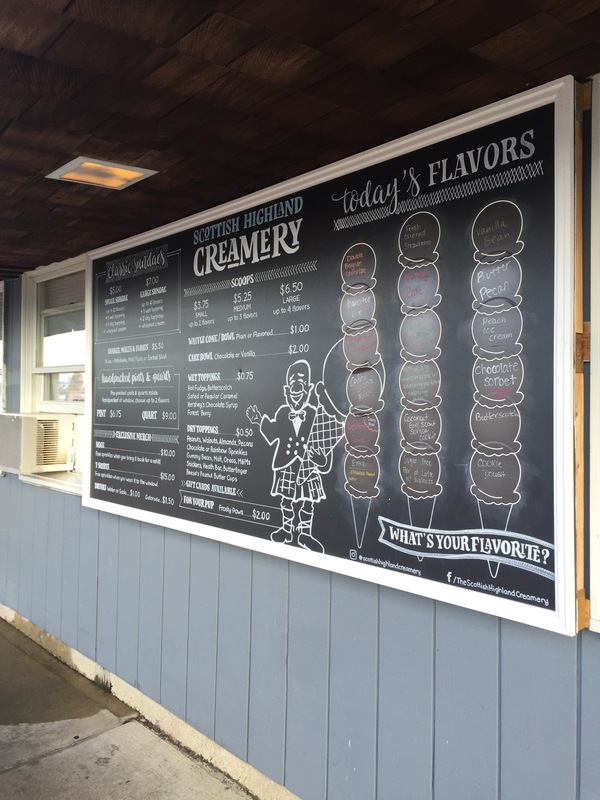 The Scottish Highland Creamery, one of the best ice creameries in Maryland, was hopping as it was quite warm during our visit and people wanted to cool down with a delicious, frozen treat. And their flavors are quite unique and tasty: I had chocolate sorbet and my husband had a heaping pile of mint chocolate chip ice cream. 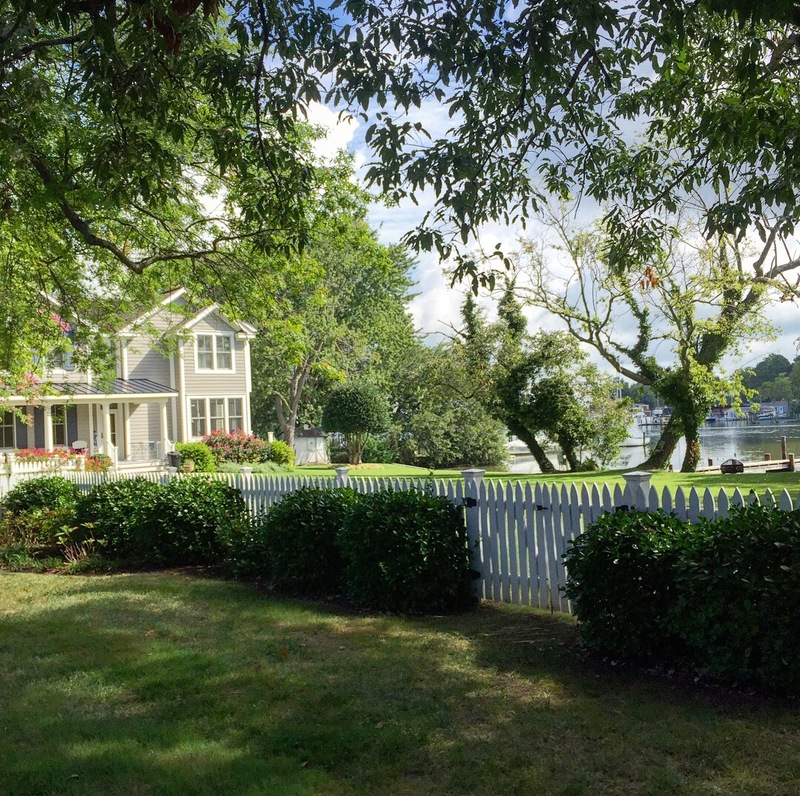 Perhaps my favorite part of the getaway was biking with my husband, as we chatted and rode side-by-side and looked at homes as we meandered our way in and out of streets and alleyways, coming upon one charming home after another. 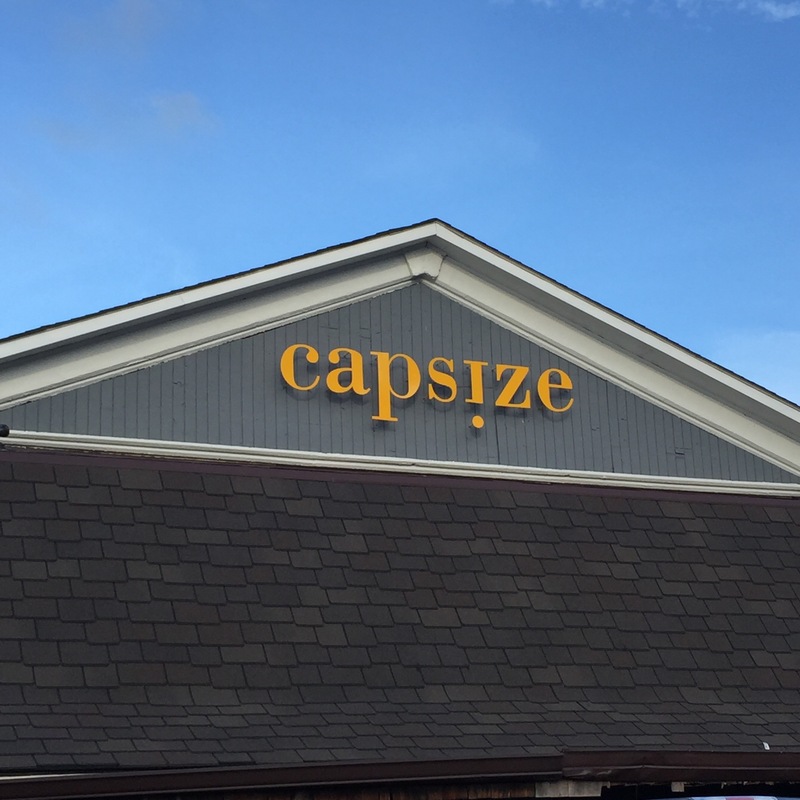 There is so much waterfront property in Oxford, and two casual restaurants that we tried were right on the water—Doc’s Sunset Grille and Capsize (that has a fantastic logo, with the “i” in Capsize upside down–see below). We had lunch at each of them, one on Saturday and one on Sunday. 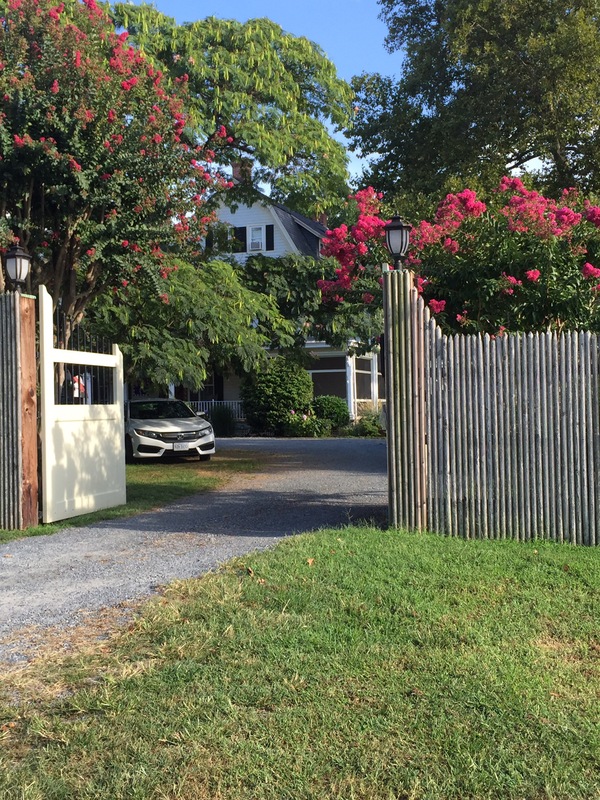 Additionally, two great fine dining restaurants are in town: The Robert Morris Inn and Pope’s Tavern. 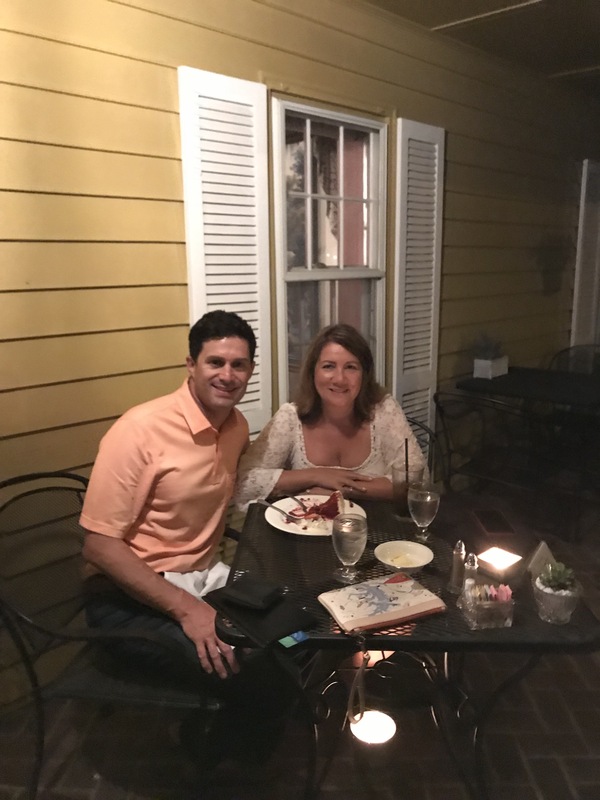 We ate at The Robert Morris on Saturday evening on the outside patio and spoke with other diners while we enjoyed a scrumptious meal prepared by Chef Mark Salter. We topped it off with a piece of Red Velvet Smith Island Cake. Yum-o. 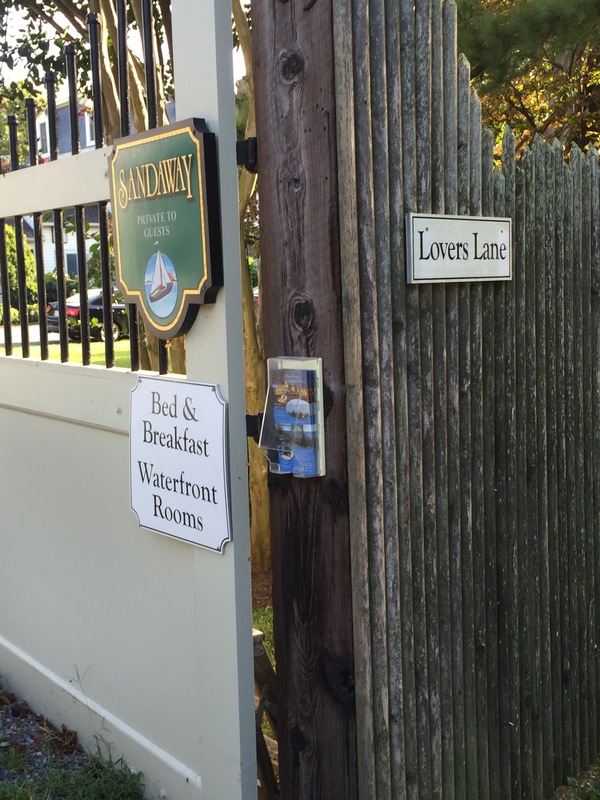 We stayed, of course, at The Sandaway Suites and Beach, the inn on which I based the premise of my third novel, Inn Significant (to read more about this book, click here), and the setting for the sequel I am presently dabbling with on and off. 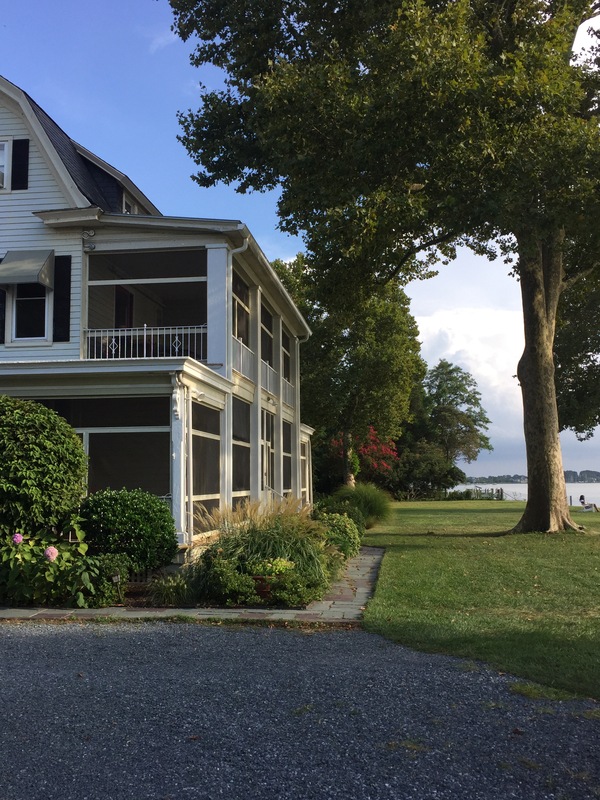 While I had talked with the folks at the Inn and had walked the property prior to writing the novel, I had not stayed at the Inn. Our room was in one of the cottages on the second floor with a great view of the Tred Avon and the lawn of the property that extends to the river, where Adirondack chairs invite you to come and sit a while. We did. We sat in the shade and watched the boats go by and talked. 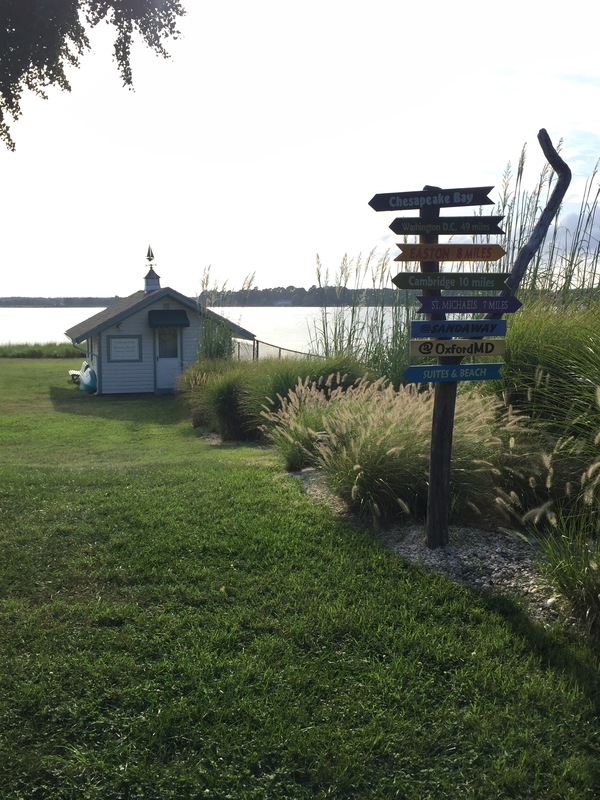 We walked the grounds and chatted with the owner. We said hello to Ben, the innkeeper. 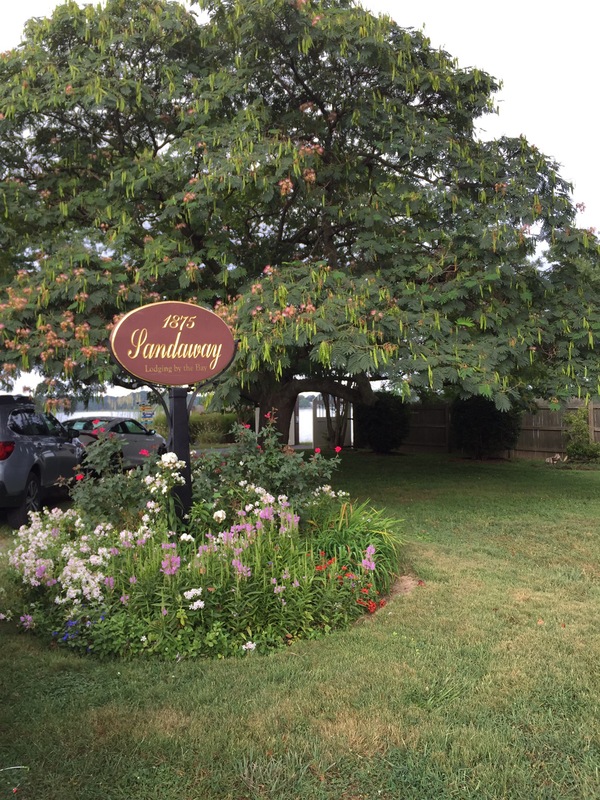 We marveled at the amazing mimosa tree on the front lawn, and I felt as if it was divine providence that I was there, as my first novel is called Beneath the Mimosa Tree (although set in Annapolis). It all came together in one magical setting, and I came away both rested and inspired. Therefore, after stalling a bit on writing the sequel to Inn Significant, I feel pleasantly motivated to begin fresh and perhaps pick up where I left off. 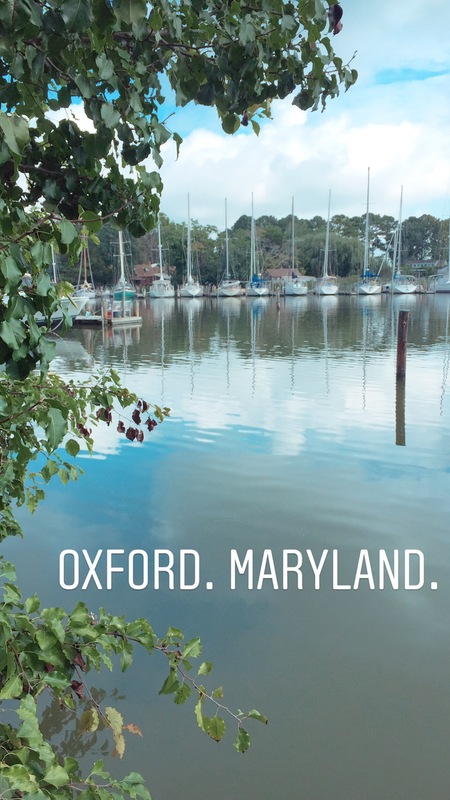 There’s something that continues to lure me back to Oxford; perhaps it’s in the winds of the place, in the shimmering water and beautiful sunsets, or in the fictitious characters that I imagine I see among the engaging real people in the town that inspire me to set my story once again in this magnificent slice of Maryland.